For ye of little faith, the wait is almost over to watch the Clintons do the perp walk. The Clinton crime family ran out of runway, and so have many who helped them cover up crimes. The former CFO of the racketeering and money-laundering enterprise disguised as a charity provided a wealth of information to the Feds. 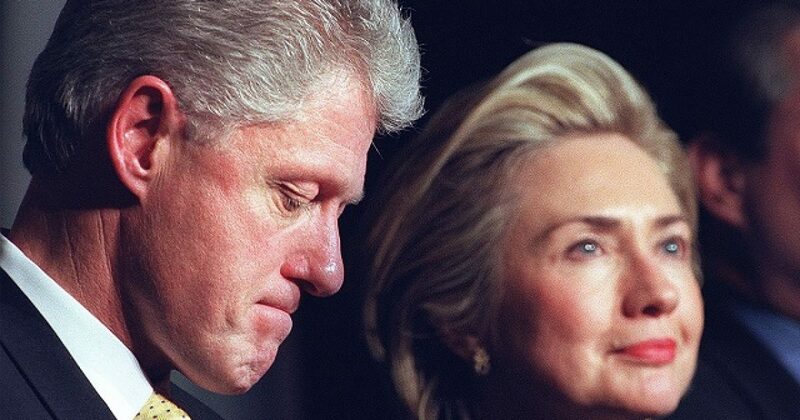 According to The Hill, next week America discovers and far and wide the Clintons treachery reaches. Problems like extravagant travel to exotic places disguised as “work”. These were taxpayer-funded boondoggles so Hillary Clinton could learn the names of world leaders. All to look more intelligent when she was to be handed the office of the presidency. But expenses are the least of TCF worries. These illegal activities reach like a diabolical octopus into governments and corporations all over the world. That’s now the game gets played. And the ease with which an investigative reporter could connect the dots makes this crime a slam dunk. Unfortunately, the media won’t touch this story and expose the Clintons. Because exposing the Clintons means exposing the Democrats. Companies and countries. And now that the Clintons find themselves in a real investigation versus the Comey sham, connecting the dots comes much easier. We have Jeff Sessions to thank for moving this investigation from under the protection of disgraced former FBI Director James Comey. By the way, Comey testified recently about his involvement in all of this. Understand that Comey won’t get out of this. After the new and improved FBI finishes with the Clintons, the only question people will ask is, “How could Comey possibly think he and the Clintons could get away with this? And we are only discussing “compliance” issues at this point. Current and former Clinton Foundation sources confirm that CFO Kessel met with MDA investigators in late 2016 and subsequently was interviewed by FBI agents in 2017. But they insist he did not implicate former President Clinton or the foundation in any illegality. Why is Mueller in HUGE Trouble as Well? When we move beyond compliance issues, we get into election influence. And as most of America has seen, Mueller expanded the scope of this investigation to include high school yearbook entries. However, what’s been noticeably missing from Mueller’s indictments are Democrats. Mueller pretends to look into the Podestas. But they should have been investigated years ago, and not for lobbying irregularities. They had direct dealings with Russia on behalf of the Clinton crime family. Further, those irregularities easily point to pay-for-play, and thus the potential for election meddling. What this investigation will showcase is how Mueller intentionally avoided looking into the Clintons. Government watchdog Judicial Watch has found a number of new explosive emails belonging to former Democrat presidential candidate Hillary Clinton. The emails contain classified information and showed favors being done for a Russia connected organization through the Clinton Foundation while she was Secretary of State. Judicial Watch sued the State Department to get the emails, and the court recently obliged. In what should come as no surprise, Judicial Watch found a series of email chains containing classified information. More importantly, Clinton refused to turn over these from the private server to the State Department as required by law. You don’t have to be a seasoned investigator to follow these clues. Yet both Mueller and Comey come off as Inspector Clousseau. Well, they aren’t that dumb. Unless they believed Americans stupidly overlook the obvious. I wrote that Comey entered the Perjury Trap he and Mueller set for President Trump. His former agency has been dismantled. And though some Comey-loving Leftist swamp rats remain, not enough to do his dirty work. Further, you can bet these vermin now keeps their heads low, lest they suffer the same fate as their former leader. Also, Comey lost his coverage from Mueller. In fact Mueller falls under as much scrutiny as Comey at this point. Even some Democrats question his tactics and motives. The ultimate fixer blew it. With Obama gone, the infrastructure of the Deep State is of little use. And with Hillary Clinton sitting in the bleachers, she has no chance of getting in the game. In short, Comey is a man on an island. But before his ship was set sail by President Trump, Comey had said a lot. And it’s those words that will haunt him. As for Mueller, slowly Democrats begin to turn their backs to him. If people have come to this conclusion, the rest of us have Robert Mueller and his special counsel investigation to thank. After nearly two years of hunting he has ensnared much small game but no large mammals. He has never produced any evidence that Trump colluded with either the Russian government or individuals “tied” or “linked” to Moscow. Paul Manafort is a tax cheat; Michael Cohen is a two-faced crook; members of a president-elect’s cabinet occasionally meet with foreign leaders; Russians posted misleading things on Facebook; most people will stumble if asked enough questions about enough topics. These not exactly astonishing conclusions are the sum total of Mueller’s efforts. It’s no wonder Democrats desperately attempt to “protect Mueller“. Protecting Mueller is all (D-NY) Rep Jerry Nadler can talk about. Nadler wants to put Mueller above the law, because he knows the inevitable end to Mueller’s investigation and Mueller. Democrats have no where to go. Thus, attack they will. Expect to see them fight like a drowning man. But they receive no life-line on this one. Democrats are dead in the water.